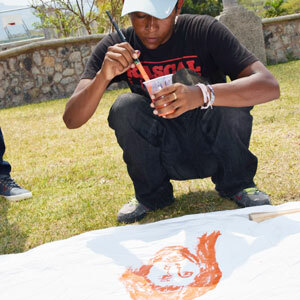 On April 12, I watched a group of street kids huddle around a large canvas on the lawn of the Micah House and begin to paint a mural. We had invited fourteen kids who sleep on the streets of the downtown area to spend the afternoon with us to commemorate the International Day for Street Children. As the boys started to paint, I realized that each of these young men had something to say, and how important it was to them that they were able to express their story on this canvas. David drew a remarkable image of Jesus, while Yovany drew a large cross surrounded by a heart. 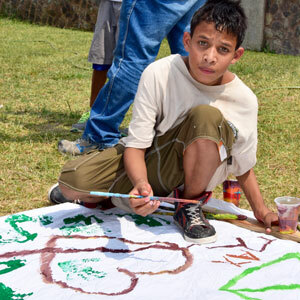 Axel Rafael, though he can't read or write, labored to write the letters of his first name and then left his handprint next to it in bright green paint. It is as if these boys, who spend their lives drifting from street corner to alleyway to broken-down building, wanted to leave a piece of themselves permanently affixed to this canvas. Through their painting, they seemed to be saying, "I know that I am invisible to many people and just a statistic to others, but I am a real live human being, a child of God who deserves more than what the street has to offer." The Micah Project exists to be a place where these boys can experience the love of the Heavenly Father and know that He is their true, permanent, everlasting home. We currently have thirty boys living in our three houses. 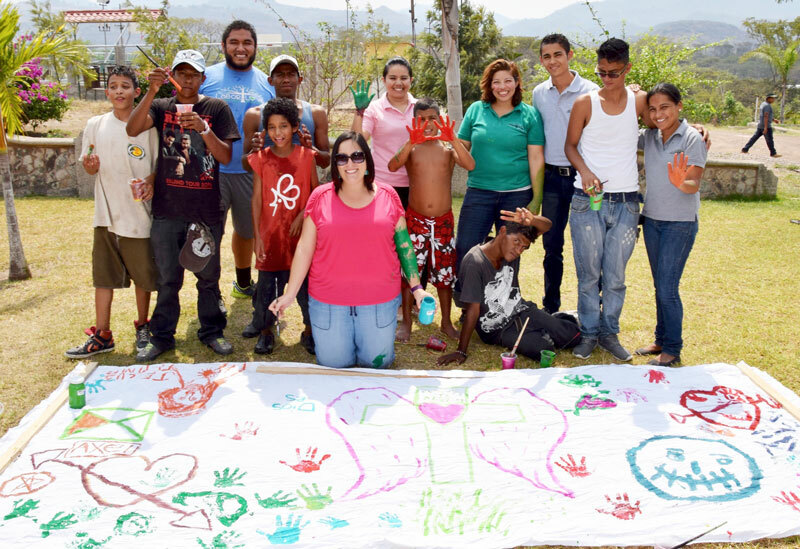 The Lord is using the Micah Project to paint a new picture with their lives, one of hope and restoration. But there are still many boys on the streets, ones that desperately need a chance at a new life. Jerson, Maycol and Leo just entered the Isaiah House in the last few weeks and are already learning new trades so that they can have a way to support themselves. But Josue, Yovany and Yoel are older teens still on the streets, and we pray daily that they will make the decision to join the Isaiah House as well. Three younger boys--Luis, Selvin and Eduarcito --have all joined the Micah House in the last few months, but there are young ones still on the streets who need this opportunity as well. We are currently praying for Elvin, Edward, Steven, Jeferson, Victor and Jose, all under the age of sixteen, who need a place to call home as well. We visit them downtown daily and our street team brings them out to Micah on a weekly basis to build trust with them-praying that each would decide to stay and become a part of the Micah family. Each time you give to the Micah Project, you affirm that indeed, these boys and young men are real live human beings...not only the thirty that currently live in the project, but also those who are in the streets and are so, so close to joining us permanently. You continue to reach out to these boys-to tell them that they are loved and that they DO deserve a chance at a future. Please consider a gift today that will go to change a life, a donation that will paint a new story of hope on these precious lives.